VANCOUVER, BC, April 13, 2018 — Mirasol Resources Ltd. (TSX-V: MRZ, OTCPK: MRZLF) (the “Company” or “Mirasol”) announces that it has been advised by Yamana Gold Inc (“Yamana”) of its decision to terminate the Gorbea Joint Venture (“JV”) in Chile. On March 25, 2015, Yamana, Mirasol and their respective Chilean subsidiaries, entered into a Letter Agreement (the “JV Agreement”), whereby Yamana had the right to acquire up to a 75% interest in nine exploration stage high-sulfidation epithermal (“HSE”) gold projects in the Mio-Pliocene age mineral belt of northern Chile, which are collectively referred to as the Gorbea Joint Venture (figure 1). During the three years of the Gorbea JV, Yamana focused its drilling activity exclusively on the Atlas and Titan projects. At Atlas, Yamana has identified a significant body of HSE gold mineralization positioned approximately 265 m below drill collar which has returned the best drill intercept of 114 m grading 1.07 g/t Au, including 36 m grading 2.49 g/t Au. During the 2017-2018 exploration season, Yamana initiated reconnaissance level surface exploration at the Ventura, Orion and Siro projects. Since inception of the JV Agreement, Yamana has incurred exploration expenditures in-excess of US$ 8,000,000 on the properties which includes 11,640 m of drilling; Yamana has made US$580,000 in option payments to Mirasol. Mirasol is operating four other large-scale JVs on Mirasol projects with its JV partners in Chile and Argentina, which are budgeted to deliver CA$ 7.5 million in JV partner exploration expenditures this fiscal year. 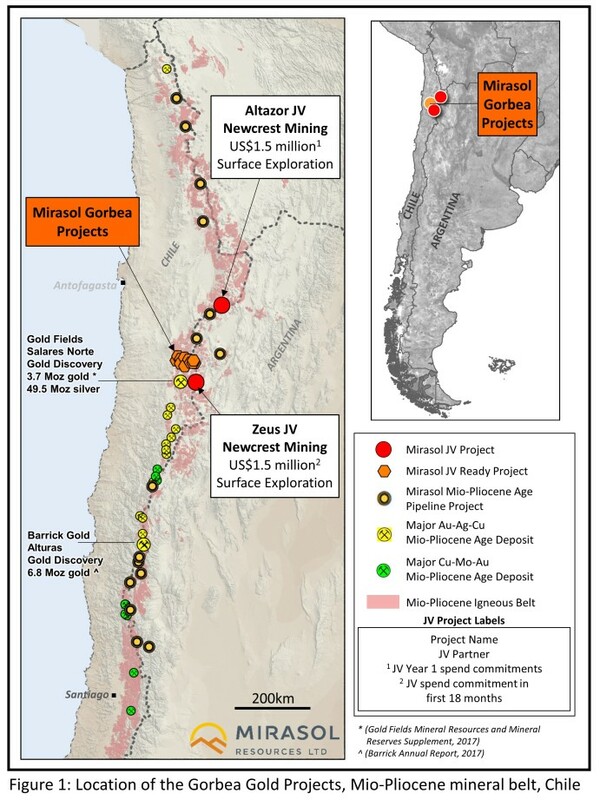 At the Altazor and Zeus projects in Chile, Mirasol and JV partner Newcrest Mining are exploring for multi-million ounce HSE Au projects in the prospective Mio-Pliocene mineral belt. In Santa Cruz province of Argentina, Mirasol will be drilling at the Claudia and Curva projects targeting high grade low sulfidation epithermal Au + Ag mineralization with JV partner OceanaGold. projects that are focused in high-potential regions in Chile and Argentina. Mirasol employs an integrated generative and on-ground exploration approach, combining leading-edge technologies and experienced exploration geoscientists to maximize the potential for discovery. Mirasol is in a strong financial position and has a significant portfolio of exploration projects located within the Tertiary Age Mineral belts of Chile and the Jurassic age Au+Ag district of Santa Cruz Province Argentina. Under the terms of the Gorbea Agreement, all exploration is managed by Yamana. All pre-Joint Venture exploration on the projects was supervised by Mirasol CEO Stephen C. Nano, who is the Qualified Person under NI 43-101. All information generated from the Gorbea Joint Venture program is reviewed and validated by Mirasol prior to release. The technical interpretations presented here are those of Mirasol Resources Ltd.
Yamana applies industry standard exploration sampling methodologies and techniques. All geochemical soil, stream, rock and drill samples are collected under the supervision of the company’s geologists in accordance with industry practice. Geochemical assays are obtained and reported under a quality assurance and quality control (QA/QC) program. Samples are dispatched to an ISO 9001:2008 accredited laboratory in Chile for analysis. Assay results from surface rock, channel, trench, and drill core samples may be higher, lower or similar to results obtained from surface samples due to surficial oxidation and enrichment processes or due to natural geological grade variations in the primary mineralization.